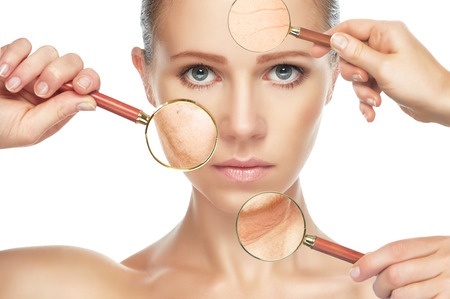 Skin Rejuvenation Laser basically, has a positive effect on skin cells. It stimulates the cells to increase the production of proteins know as collagen and elastin. The purpose of these proteins is to make your skin firmer and stronger, leaving you feeling refreshed and revitalised. The appearance of ageing skin, facial scars, acne and pigmentation can also be reduced as a consequence of stimulating the cell rejuvenation system. The short answer is, anyone and everyone! Although, treating older people, due to the anti-ageing nature may be an assumption, younger clients find they love the skin refresh. Life is tough and hard and it can leave your skin feeling tired and dull. Its good to know, that you can safely achieve a healthy glow, by having a simple skin rejuvenation laser treatment. Initially, a consultation is essential to select optimal settings for treatment and medical suitability. This will help us tailor the treatment for your own individual requirements. We are proud to uniquely provide Skin Treatment Pricing per cm². Because this ensures that at Clear Medical the pricing is concise, consistent and fair. The Laser Skin Rejuvenation treatment directly stimulates the production of collagen and elastin by manipulating the immune system to imitate damage. Thus, initiation of a renewal response occurs, which is great. The treatment works by utilising a pure white light therapy. This is emitted in a series of short pulses directly onto the skin. In a sense, the skin suffers harm to a level that is safe, but this acts to cause the rate of cell renewal to increase. As we age, the production of collagen and elastin decreases due to a decline in the rate of cell renewal. Metabolic processes within our body link to the rate of cell renewal. Consequently, we have fine lines and wrinkles. Skin Rejuvenation can be conducted regardless of the age of the candidate or the area being treated. You will benefit from the treatment by acquiring improved skin tone, texture, and additionally the “ironing out” of fine lines and wrinkles. Many people find a more uniform complexion and pigmentation of the skin. 1. Firstly, Gentle cleaning of the skin is neccessary to remove chemicals. Application of ECG (Electrical Conductivity Gel) on the treatment area is neccessary. The ECG gel cools the area and ensures optimal light transmission from the applicator to the skin for the most effective results. 2. Your therapist will select the optimum setting which is safe and effective for you. During a patch test consultation the individuals specific setting is selected. 3. The skin surface has a quartz applicator placed onto it. Light pulses travel through the quartz applicator into the skin. Neighbouring skin has the same thing done to it, until all areas are covered. 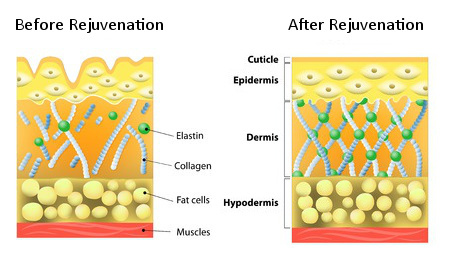 Initiation of increase in the natural rate of skin cell renewal is induced and will continue after treatment. 4. Finally, we clean the skin and apply barrier protection. Our Clear Medical treatment policies specify that individuals can have treatment 5 days after a successful consultation and patch test. Treatments are every 4 weeks (minimum), therefore it takes time to work with the natural cell production rate. However, the results are natural looking and safe. The actual number of treatments required by an individual varies from person to person. On average, people undertake 6-10 treatments, to surely observe the full extent of the benefits of skin rejuvenation laser. Our clients have told us they can see and feel the improvements after their first treatment. You may experience a mild heat sensation on the treatment area but this is nothing to worry about. This happens due to the absorption of the light energy by the skin which causes it to heat up. Most clients describe the discomfort as moderate and acceptable. However, you should keep in mind that it is specific to the individual as everybody has different pain thresholds. Some clients experience a reddening of their skin immediately after the treatment which disappears within hours. However, the majority of the patients experience no side effects.